The world‘s first ocean-going solar yacht combines high-tech, sustainability, a contemporary lifestyle and luxurious accommodations. After five years of research by the Swiss company SolarImpact Yacht AG, the vision of a seaworthy solar yacht with futuristic modern aesthetics has now been realized. This innovative high-tech design concept was developed to combine luxurious convenience, modern design, and sustainability, and make it capable of sailing the high seas. 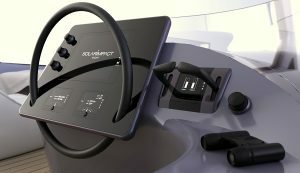 This revolutionary ship technology was first unveiled at the Cannes Yachting Festival, Sept 11-16th, 2018, where visitors explored a virtual 3D model of the solar yacht. With the development of its yacht, the company is fully in line with the trend of the current energy transition, and thus creates an almost unlimited range for a whole new maritime experience. This new yacht is a game-changer, not just in terms of its solar propulsion and design. Two aspects that have prevented a pleasant stay on board in the past have also been addressed: rough seas and high noise levels. The innovative solar yacht glides almost silently and without swaying – even over waves several meters high. The hull technology is based on the SWATH (Small Waterplane Area Twin Hull) construction principle, which has been known since 1938 but was previously reserved for special ships only: two torpedo-shaped buoyancy hulls under the water surface support the ship. This achieves a physical shaft decoupling that reduces the rolling and heeling of the yacht by up to 90 percent. It lies calmly in the water even in strong swells, putting an end to the annoying swaying motion of the boat. But SolarImpact has recognized that the principle offers yet another invaluable advantage: it significantly reduces energy consumption. All systems on board can use the sun as their primary energy source. The yacht‘s solar drive is not only environmentally friendly but also extremely quiet. Not only is the solar yacht almost self-sufficient in terms of energy, but with a top speed of over 20 knots, it is also exceptionally fast. This is due to the technical components used, which collectively ensure the yacht‘s high overall efficiency and are optimally controlled using artificial intelligence (AI). All key systems are highly automated so that a single person can even maneuver the yacht. “Our yacht sets new standards when it comes to user-friendliness, convenience, and individual freedom. At the same time it caters to a growing desire to trend towards moving one‘s center of life permanently onto the water,” explains Werner Vögeli, CEO of SolarImpact Yacht AG. The 78-foot yacht offers 340 square meters (3,660 square feet) of luxuriously and functionally designed living space on three levels, and a wide range of options regarding interior furnishings, design, and modern lighting, air-conditioning, and sound solutions. The primary energy required for this, too, is supplied by a total of 300 m2 of the solar surface; all important components have a redundant set-up. A diesel aggregate additionally ensures the yacht‘s comprehensive operating reliability, even in unfavorable weather conditions such as longer periods of cloud cover.